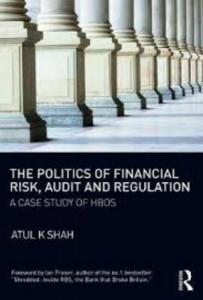 In The Politics of Financial Risk, Audit and Regulation: A Case Study of HBOS, Atul K. Shah utilises the case of the HBOS collapse of 2008 to critically examine financial regulation by governments and the audit profession. Strongly implicating banking culture and an absence of ethics in the sector in bank failures and wider financial crises, this book is an impassioned and impressively researched call for change, finds Prabhu Sivabalan. Dr. Prabhu Sivabalan is an Associate Professor at the UTS Business School. His research specialises in the operation of management accounting systems in a range of innovative contexts, including healthcare. His work focuses on the effect of accounting performance measures and devices on employee incentives and their consequent organisational outcomes. Professor Sivabalan’s work has been published in leading academic journals globally and he has lectured in the postgraduate programmes of the London School of Economics and Political Science and the Said School of Business in the University of Oxford. Professor Sivabalan currently leads the Financial and Performance Transformation Group in Healthcare, a collaboration between the UTS Business School and NSW Health.